Yesterday was Sunday, It was miserable & cold out – most definitely a Roast Chicken Dinner kinda day. After a quick trips to the supermarket I got a really nice size chicken for £3.50 (thank you Sainsbury’s!) which I basted with lemon and pepper and popped in the oven together with some stuffing I threw together. I was just about to peel the potatoes when I remembered some magnificent potatoes that my mum made for supper a couple of years ago. They were like a whole potato but sliced not quite all the way through which left them crispy on the outside and soft and fluffy on the inside – simply divine!! I fondly remembered these as hedgehog potatoes but a quick Google search later and I was reliably informed these were called Hasselback potatoes, which originate from the Restaurant Hasselbacken in Sweden, which means I’m no longer limited to meatballs and gravadlax as my only exposure to Swedish cuisine! Hasselback potatoes are usually made with medium size spuds but as I had a load of new potatoes in I pushed the boat out and made mini ones. Yes these are a little more work (more slicing and basting) but I couldn’t believe how easy these were to make in the first place so it really was no harder than peeling and roasting traditional roasties. 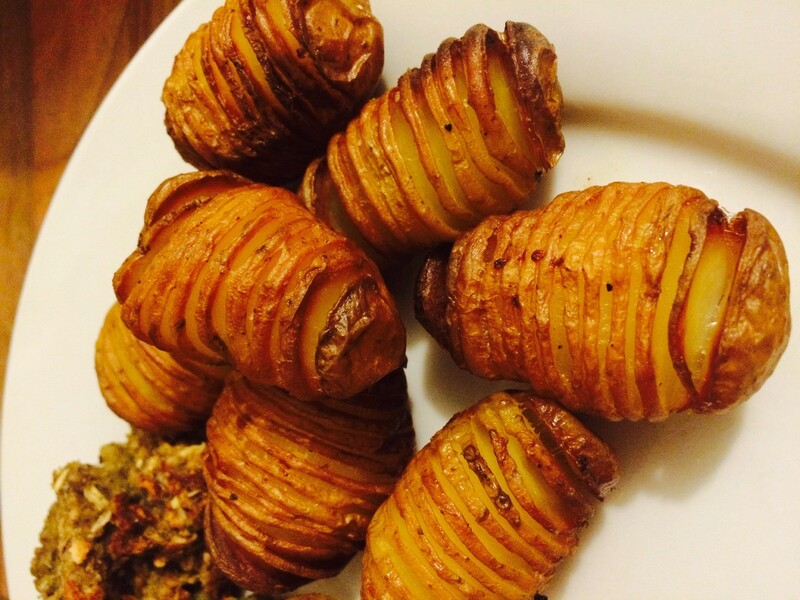 I thought it was high time that I shared another blog post so forgive me for being absent of late (more of that later) and please enjoy my mini hasselback potatoes!! Lie each potato lengthwise on its back and then with a sharp knife make lots of thin slices widthways 3/4 of the way through potato. Lay these in a baking tray and then smother with butter & drizzle with a little olive oil. (the combination of fats according to my mum makes them taste flabulous!! Once cooked these should be golden brown and the slits should have opened up to give you an incredibly looking and tasting potato – that will impress guests when in reality they are really easy to make! Previous Post Have you ever had one of those days/weeks/years..?